P, R.Rr. Agnes H. (2007) Gambaran perilaku pengemudi mobil pribadi di Jakarta. Skripsi thesis, Universitas Tarumanagara. 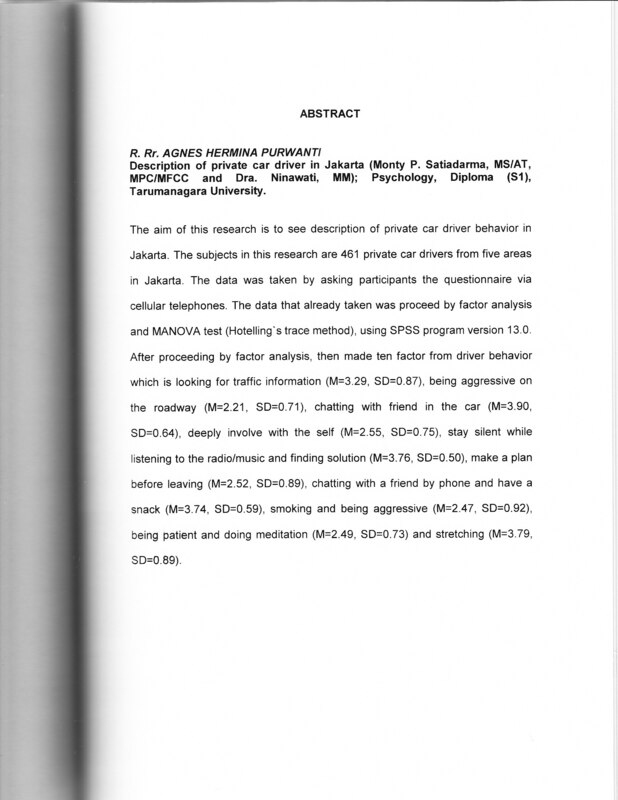 The aim of this research is to see description of private car driver behavior in Jakarta. The subjects in this research are 461 private car drivers from five areas in Jakarta. The data was taken by asking participants the questionnaire via cellular telephones. The data that already taken was proceed by factor analysis and MANOVA test (Hotelling's trace method), using SPSS program version 13.0. After proceeding by factor analysis, then made ten factor from driver behavior which is looking for traffic information (M=3.29, SD=0.87), being aggressive on the roadway (M=2.21, SD=0.71), chatting with friend in the car (M=3.90, SD=0.64), deeply involve with the self (M=2.55, SD=0.75), stay silent while listening to the radio/music and finding solution (M=3.76, SD=0.50), make a plan before leaving (M=2.52, SD=0.89), chatting with a friend by phone and have a snack (M=3.74, SD=0.59), smoking and being aggressive (M=2.47, SD=0.92), being patient and doing meditation (M=2.49, SD=0.73) and stretching (M=3.79, SD=0.89).